Pet Shop Boys are the UK’s most successful pop duo with 12 Top Ten studio albums and 40 Top 20 singles, including four number one records. 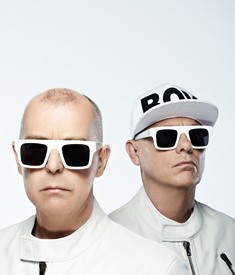 Neil Tennant and Chris Lowe first met in 1981 and began writing songs together. Their first single “West End girls” was released in 1984 as a one-off single but the following year they signed to Parlophone/EMI Records and a new version of “West End girls” climbed to the top of the charts. The single went on to reach number one in nine countries, including the USA. Their success continued with the release of further UK number one hits, “It’s a sin”, “Always on my mind” and “Heart”. They won Brit awards for Best Single in 1987 and Best Group in 1988. Other awards have followed, including Ivor Novello awards for songwriting in 1987 and 1988 and, in 2000, a third Ivor for Outstanding Contribution to British Music. In 2009 they were presented with the Brit Award for Outstanding Contribution to Music. Their musical collaborations have included duets, productions or remixes for Dusty Springfield, Liza Minnelli, David Bowie, Elton John, Blur, Yoko Ono, Electronic, Rammstein, Madonna, Lady Gaga and The Killers.